Dartmouth Dining Services launched several new initiatives in winter term, including napkin location changes. When Dartmouth students returned to campus following winter break, they discovered something missing when they sat down to eat at dining facilities across campus. The napkin dispensers, once located on each table, had disappeared without a trace, replaced with wall-mounted models. This change was one of several new initiatives launched by Dartmouth Dining Services at the start of the winter term, which also include a text messaging feedback service and digital menu boards. Many of these changes were initiated by food service director Jon Plodzik, who joined DDS this past fall. The menu boards in the Class of 1953 Commons, which had previously displayed PowerPoint slides, are now created with Computrition software to include portion sizes and dietary information, which had previously been located on physical cards in front of the entrées. The Courtyard Cafe now has digital screens to display menus as well. The software allows DDS to create menus in a more streamlined way, referencing the nutritional information from DDS’s food providers. “It showcases what we’re doing in a modern way,” said Arliene Belock, administrative and catering coordinator, who has led the effort since July of last year. After feedback from students, DDS plans to increase the menu font size as well as educate the community about the new allergy symbols it is employing in lieu of those that had been on the physical cards. Supplementing the new menu boards, an electronic kiosk located near the entrance of ’53 Commons will provide specifics such as calorie count, sodium levels, sugar contents and other nutritional information for the food being served. According to DDS staff, this information has always been available to students online, but the staff hopes it will be more accessible with a physical kiosk. The changes are part of an effort to increase awareness about health and nutrition in partnership with Beth Rosenberger, Dartmouth’s registered dietitian. “Not every school has a dietitian as a part of the dining program, so I want to take advantage of that, for [the students’] benefit,” Plodzik said. Whether the relocation of the napkins will result in a palpable decrease in napkin use is yet to be seen. As noted by some students, such as Nicolas Bergen ’20, people may be more likely to take more napkins than needed for conveniences’ sake. “I think most people enjoyed the old napkin dispensers,” he said. Amauri Ross ’19 agreed that relocating napkins may not bring about the desired change and suggested that DDS encourage people to be more conservative with their napkin use instead. However, he does not see the napkin removal as a huge issue, noting that what would be worse would be removing the green plastic bags for takeout. In addition to sustainability, Plodzik noted the significant amount of time and energy that had been spent on refilling each napkin dispenser — over 200 of them in ’53 Commons alone. DDS staff spent anywhere from two to three minutes per dispenser as needed each day, requiring a minimum of approximately six hours a day simply refilling napkins, according to Plodzik. DDS associate director Don Reed also noted this task is especially difficult for the DDS workers who have disabilities. Plodzik said that one of first things DDS staff told him when he arrived at the College was how cumbersome refilling napkins was. Removing these dispensers from tables has not only addressed sustainability and efficiency, but also given room for a new addition to the tabletops: mini six-panel displays called “table tents.” The table tents were directly influenced by Plodzik’s time at UNH, where he said the tents provided a unique way for the dining staff to get messages across to diners about general health as well as special events. Additionally, he said they were extremely popular among student groups who purchased advertising space on these displays. 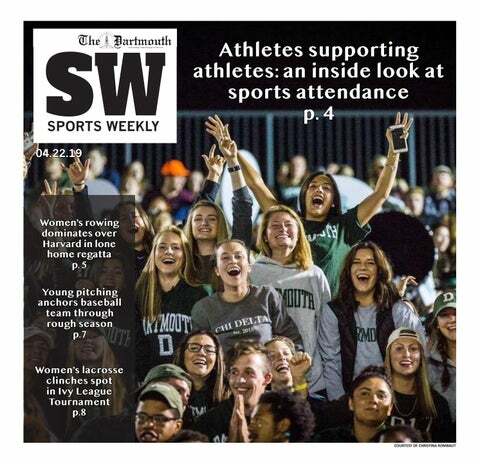 Student groups at Dartmouth can purchase advertisements for $175 to $200. Plodzik believes the spots will be taken up quickly, and Belock said two groups have already asked about acquiring the space. DDS’s new texting services can receive questions, concerns, suggestions and comments from diners, as well as send subscribers text messages about upcoming dining-related events. The text-in service has received 800 messages as of Jan. 10, primarily concerning food suggestions and inquiries about napkins. The subscriber service called “The Scoop” offers students updates when there are promotions or special events at any of the dining locations. Simultaneously, the texting service functions as a direct way for diners to communicate with DDS staff members about their immediate needs, such as empty napkin dispensers or fork shortages. Samantha West ’20 also liked the service and finds the interactions entertaining but is not yet sure what the effects will be. “I don’t know how much good or change it’s doing, but it’s funny and enjoyable,” she said. DDS plans to use the texting program to map trends of diners’ requests to better tailor the dining experience to students’ needs. As of yet, not enough time has passed to quantify the tangible effects of the changes, but Plodzik hopes that the changes will ultimately benefit the students, both in terms of efficiency and cost.